You don't have to wait until the closing weekend to engage in Plein Air Easton! The entire week features a full schedule of lectures and demos. Make sure you take advantage of this incredible learning opportunity. Juried Plein Air Artist Joe Gyurcsak shares with us some of his best tips for dealing with moving light and shadows in your outdoor landscapes. Come see the retrospective exhibit at the Avalon Theatre. The theatre has been converted into a great cafe space with food from Hill's Cafe & Juice Bar​, coffee from Rise Up Coffee Roasters​, and a schedule full of incredible lectures that you will not want to miss. The artists have chosen their favorite piece from the Tilghman Paint Out pre-event. Find out who it was so you can keep an eye on them throughout the festival. 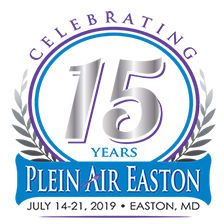 Plein Air Easton is finally here!! But it is hot and humid so to keep you safe and comfortable, Kate Richards from Hill's Drug Store is here to give you tips to beat the heat. Attention collectors! Don't miss a single opportunity to find the perfect addition to your Plein Air collection! In our second installment of Plein Air Easton's video series, we are presenting the events that artists of all stripes will not want to miss out on. Plein Air Easton offers several events for the littlest artist in your life. Designed to instill a love of art at the earliest age and even nurture future plein air painters, most of these events are free and all of them are outdoors so bring your kids and join in the plain air fun.